Bring the great outdoors into your home with Renee Leone's Travel Watercolor Series. Travel from the comfort of your home to the iconic western wilderness with each glance at Renee Leone's unique watercolor scenes. Spruces of the Pacific Northwest features tall and vivid trees and majestic mountainsides reflected in winding rivers. 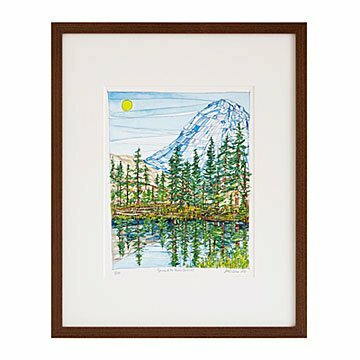 Complemented with a java-finished poplar frame, the unique geometric style of the piece brings a modern vibe to classic landscape paintings. Hand signed and numbered print in a limited edition of 250. Print made in Chicago. Frame made in the USA. Check out Renee Leone's other Regional Tree prints: Desert Cacti of the Southwest, Pines of the Midwest, Maples of the North Atlantic, Birches of New England and Aspens of the Rocky Mountains. in our living room and a very nice looking piece. no surprises - came is it looks online.